Do you have a new product or service you want to let people know about? Is your ultimate goal to get media coverage? Here are a few tips to think about before you reach out to the media. Timeliness: Is it timely? News cycles are getting shorter in the digital age. Significance: Is the news of great significance to others? Proximity: People are more interested in news close to home than they are news outside their community. Impact: Does your news matter to whomever is reading it? Does your story pass the “so what” test? Human interest: People are interested in stories about other people. 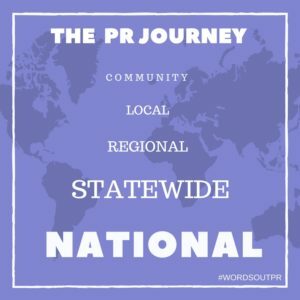 Once I was representing a school and an editor told me, “We aren’t interested in publishing articles about your school plays or open house, we want the story about an Eagle Scout student who raised enough money to fund a classroom renovation.” In other words, they wanted the human interest story. 2. It’s about relationships! You mustn’t spam the media. These are real people who will be much more likely to hear you out or read your pitch if you connect with them on a human level—meaning, introduce yourself first! Whether that is through a stand-alone introductory email, connecting on LinkedIn, or subscribing to and commenting on the journalist’s blog, make sure they know who you are before you send a pitch or make a cold call about your product or service. 3. Start local, build national. If it’s national coverage you seek, in most cases you’ve got to start in your own backyard to build credibility. Think: community, local, statewide, regional, national. The national news outlets will search your business before responding to you. If they see that you have already garnered publicity in your region, they’ll figure you’ve got experience in working with the media and you’re “ready to go” in terms of being prepared for greater coverage. Working with your local media contacts will give you experience and the chance to work out any kinks before approaching the big guys. 4. Find your USP. What is your unique selling proposition (USP)? What makes your product or service stand out from the rest? Very few businesses are one-of-a-kind. The key to effective selling is to determine your USP: the reason your product or service is different from and better than that of the competition. This will help in creating the angle for your news release. 5. Serve up your story on a silver platter! When editors are on deadline and they’re faced with several hundred story ideas, the often think, “What do we have that’s ready to go?” If you’ve provided them a news release written in Associated Press style, along with high resolution photos, quotes from sources and contact info for any last-minute questions, your package will be more likely to be picked up than those who weren’t as prepared. If you aren’t sure you can create news legs, determine your USP or serve up that silver platter, call a public relations (PR) professional to help. Those are the kinds of creative things PR folks for their clients every day.